I am absolute crap when it comes to describing purples and to top it all off, it's just about impossible to accurately capture purples. But I did my best. *Speaks to polish* I like you. Very, very much. These pics are much too blue. 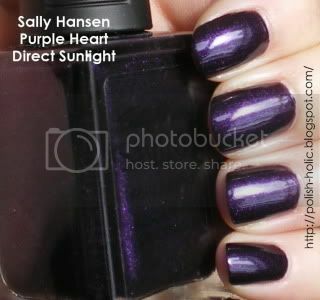 I would call this a shimmery royal purple. 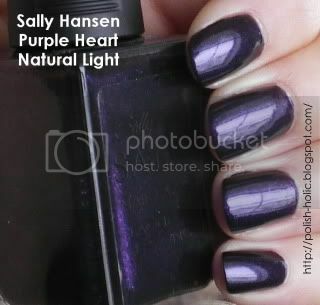 Another one from the Sally Hansen Runway collection. Two coats, no topcoat. As usual, there were no application issues. Glides on like... I don't want to use the word butter. What else is smooth? Mayo. Glides on like mayo. Mmm, I loves me some mayo. Now a little blog business. Some of you may have noticed that I've enabled Adsense on this blog. I bounced back and forth for a while about this. I felt like getting Adsense was selling out, especially when I started this blog as sort of a public resource. But I made up my mind when I hit the post office today. It'll take about $15 to ship the giveaway package, depending where it goes. I'm a little bit jobless and I've already started buying polishes for the next giveaway. So Adsense it was. The profits from Adsense will be used to finance future giveaways, because I like buying crap for other people. Lol. I still haven't decided about Adsense myself! I go back and forth over it. I tell you though, shipping and funding giveaways are the main reason I would do it, if I do decide to. I do a lot of swapping, and the shipping bites me every time. This is a GORGEOUS shade of purple! *Nods* And shipping is crazy up here in Canada. I also didn't realize how many polishes I had for the giveaway until about a week before I did the giveaway. I just add and add. So I figured it was definitely time to find a way to pay for the giveaways because I certainly wasn't going to stop. And oh yes. I absolutely love it. It's kinda meh in the bottle. But on the nail, it's just woooow. Loooovely purple. I waaaaaant it. Stephanie: Sellout is a harsh harsh word. But it works so well in this situation. And isn't it a fantastic purple? Too bad I couldn't perfectly capture the shade. shekinaah: Awww, thanks. That makes me feel better about it. That purple is freaking beautiful! It totally is. And the kicker is that it actually looks even better in person. Gosh I love anything purple! Anything! And I'm actually scared of putting adsense on anything. I've heard so many horrid stories about people's blogs being shut down because of it! Although who knows if they're actually true or not. I hope everything works out! I agree about shipping costs though. Egh. Hopefully an affordable fuel will be here soon! SeeingSunshine: Whoa, what now? Blogs getting shut down? Yes. I was reading an article about people making extra money by putting adsense on their preexisting blogs/making new blogs to put adsense on. There were people saying that their blogs were shut down without any notice apparently because the people who run adsense thought they were clicking their own ads or having family click ads repeatedly. Oh, whoa. I didn't know about that. Thankfully, I've only got the one blog. Lol, oh I wish it worked like that. But sadly, I don't get to pick my ads. I guess there just aren't any pretty picture ads for nail polish.